SUMMERSMASH FESTIVAL, TYLÖSAND JULY 20TH – AUG 4TH 2019! 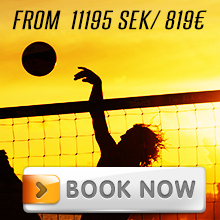 Improve your beach volleyball game with world class coaching and BeachTravels unique technique and play concept. On our 40 courts we offer lots of tournaments! Enjoy summer’s most relaxing beach hangout at our big open-air refreshment lounge, accompanied by Sweden’s west coast most eminent DJs. Check out the pro’s when they play high-class beach volley, then party all night long! See more info at www.summersmash.se. PRAIA DA ROCHA, PORTUGAL APRIL 27TH – MAY 11TH 2019! The best beach in Europe, amazing Praia da Rocha in Portugal, is where we offer WORLD CLASS COACHING in BEACH VOLLEYBALL and you get to experience an AWESOME BEACH LIFE. We’re stoked and happy to Warmly Welcome all old and new members to our big beach family! The unique camp with world class training is right for EVERYONE! The newcomers, the families, the singles, the friends, the groups, the indoor players, the pros AND the beginners – anyone of any nationality that’s looking for an awesome and exciting experience! More info about BeachTravels in Praia da Rocha here! ELITE TRAINING CAMP IN LAS PALMAS JAN 20TH- FEB 17TH 2019! Escape the winter darkness and enjoy the sun, warmth and individually adapted elite training in beach volleyball at the beautiful Las Canteras in Las Palmas. This is an unique opportunity to train as a pro! Read more about the Elite training camp in Las Palmas here! From 20180525, our new, fresh privacy / gdpr policy applies. Check it out here!